Her next stop is a high school in Jamaica. Black’s car suddenly pulls to the curb. There’s a pause, then an abrupt U-turn in the middle of a busy street, followed by a frantic acceleration onto the Belt Parkway. Usually when Black goes east, she’s headed to her $4 million house in Southampton, in a more comfortable ride. Today, she’s wedged into the backseat of a city-issued Prius. The car slows. Hesitates. Turns right … onto a service road leading into JFK airport. Has Black, just weeks into a bumpy transition from magazine-company executive to boss of the city’s fractious public-school system, already decided to hop a flight and flee? Another U-turn, then a dash onto the Van Wyck heading north—and into total gridlock. Black’s beleaguered driver inches across two lanes of bumper-to-bumper traffic, then lurches for the first exit, which leads to a thicket of auto-body shops and fast-food joints. The Prius pulls up in front of Hillcrest High School, somehow only ten minutes behind schedule. Inside, Black shakes hands and listens intently as a group of the high school’s top students praise their teachers. Hillcrest is in many ways a success story. Its student body is rich in ethnicities and languages but poor enough that 68 percent of the kids qualify for free lunch. Five years ago, with the help of a Gates Foundation grant and management direction from New Visions for Public Schools, Hillcrest’s 3,000 students were divided into seven self-contained programs, and the four-year graduation rate has climbed to 70 percent. But classrooms are crowded, and Principal Stephen Duch, who’s had to trim spending by 10 percent in the past two years, fears additional budget cuts will worsen the strain. Black steps into a room full of kids huddled around laptops, part of the city’s new “Innovation Zone” project integrating online learning with brick-and-mortar schools. She asks rapid-fire questions—“How does it compare to your regular classes? Who grades it? How long have you been in an iZone? Who monitors it? Are these their own laptops? Can they work in teams?”—but takes no notes, though she clutches a small notebook covered in bright-red suede everywhere she goes. Black is unfailingly pleasant, if a bit distant. Until she enters a business class. The teacher, Michele Gensler, tells Black that her students are preparing for a competition in which they’ll pitch mock start-ups to adult business leaders. Black’s blue eyes shine. For the first time today, she eagerly volunteers advice. “Just smile,” she tells the students, leaning across a cubicle wall and looking at each of them in turn—and smiling. “Smile at them, and they’ll respond to you!” The students are quiet, not sure what to make of the cheery blonde stranger in the snappy charcoal-striped pantsuit. “Yes, that’s what they do,” Gensler says. Last summer, New York State raised test-score standards, and the city’s proficiency rates crashed. New national curriculum guidelines are looming, necessitating an overhaul of the core courses taught in most New York schools. And, perhaps most critical, a massive state-budget deficit threatens to force the layoffs of thousands of teachers. In other words, this is a pretty good moment for a superstar manager of the school system. Could that really be Cathie Black? By itself, Black’s comment about my security sticker is harmless—except that she makes it one week after glibly joking that birth control could help solve school overcrowding, thereby setting off a small furor. It makes me wonder about her political instincts. She’s either admirably authentic or remarkably clueless about the brighter spotlight that now follows her. In 1983, Black left New York for USA Today. 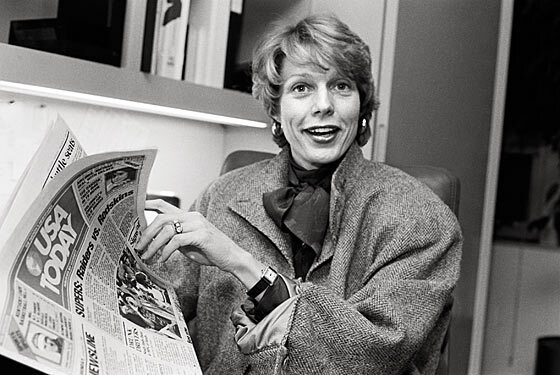 “People thought I was crazy: ‘You’ve got a great job in New York and you’re going to put yourself into the fray of the newspaper business, where you’ve never been? With a start-up that is not going to make it?’ ” she says. “But I thought to myself, This is an opportunity to throw myself into a real game-changer. This could completely transform the future of the newspaper business.” Plus her husband of one year, Tom Harvey, a lawyer, was working for Republican senator Alan Simpson in Washington, D.C., not far from USA Today’s offices in suburban Virginia. Her most dramatic delivery of cold reality came in January 2002. Talk magazine had been launched in a whirlwind of hype, glamour, and ego. Celebrity editor Tina Brown teamed with Harvey Weinstein of Miramax to create not just a monthly magazine but a book company that would synergize their access to Hollywood, Washington, and Wall Street. Or something. Hearst signed on as a financial and distribution partner. Which didn’t mean that the expensive conceptenjoyed Black’s enthusiasm. “When the idea is your idea, you usually champion it. And when it’s not, you usually don’t,” says Ron Galotti, the brash former publisher of Vogue who joined forces with Brown and Weinstein in the new venture. “And Talk wasn’t Cathie’s idea.” Black shut down the magazine after two money-losing years. Her aphorism-stuffed how-to-get-ahead-in-business memoir, Basic Black, came out in 2007, and Hearst threw a series of parties to help promote the book, rankling some staffers who thought Black was hogging the spotlight. One guest, a longtime colleague of Black’s, was reminded of a different setting. “I remember going into her home library, and it’s all these books: Swim With the Sharks Without Being Eaten Alive, What They Don’t Teach You at Harvard Business School. All these self-help business books, hundreds of them: ‘How to do the direct eye contact,’ ‘How to learn how to shake a hand,’ ‘How to learn to tell people you’re listening.’ All these tricks!” She was less of a superstar manager, in this view, than a gifted saleswoman of magazine ads—and herself. When Joel Klein accepted the job of schools chancellor, he told the mayor he’d be happy to stay for two full terms. But then Bloomberg decided limits didn’t apply to the mayor’s office and asked Klein to stay through the start of Bloomberg’s third term. Quietly, the mayor began looking for a new schools boss. As the Times first reported, Bloomberg approached Geoffrey Canada, the founder of the Harlem Children’s Zone, who decided to stay put. Michelle Rhee, the combative ex-head of Washington, D.C.’s schools, also would have been a logical contender, but she was on her way to launching her own multi-million-dollar school-reform operation. So Bloomberg, in a move many of his top aides didn’t see coming, turned to Black. That Black is friendly with Diana Taylor, Bloomberg’s girlfriend, didn’t hurt her chances. But this hire was all Bloomberg. 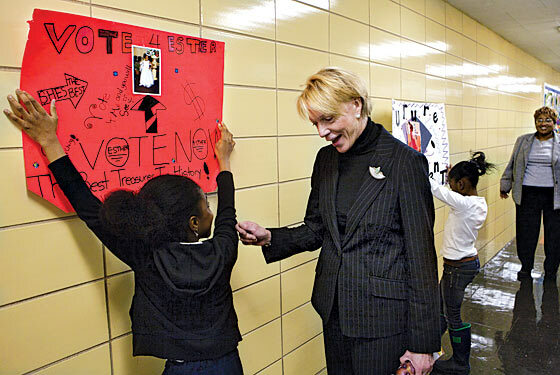 Choosing Black ratchets up the pitched argument that the mayor and others have been waging with the public-school Establishment for the past decade. In Bloomberg’s CEO-minded view, public schools are a closed society dominated by self-interested unions, desperately in need of free-market shock treatment. If only enlightened capitalists could wrest control of the schools from the hidebound, unionized teachers, the schools’ problems could be solved. This is a tremendously fashionable idea among the country’s business class, partly because it is so flattering to their self-image, and it’s reflected in the cult of Waiting for “Superman,” the 2010 charter-school-glorifying documentary starring Canada and Rhee that’s a favorite of the hedge-fund set. The new chancellor brings a practical value when it comes to this group. “Cathie attended the Allen & Co. conference in Sun Valley every year as a Coca-Cola board member,” a corporate executive says. “In that room is several trillion dollars in net worth. If you look at who has funded these charter schools, it’s these same guys. One of her roles is to keep that going.” When Black talks about exploiting her ties to the business community, she sounds like a full-time, more energetic version of Caroline Kennedy, Bloomberg’s first emissary to the big-money donors. “I haven’t run across anybody that I know in the business world in the past five or six weeks who doesn’t say, ‘Just tell me what you want me to do,’ in this totally open way,” she says. “They want New York City schools to succeed. I saw a whole bunch of people the other night—‘Just call me! Anytime you want, just call me!’ Stan Shuman at Allen & Co., Terry Lundgren at Macy’s.” In the current climate, with public budgets being slashed, that pipeline matters more than ever to sustaining the growth of the charter business. All of which, however, is secondary to why the mayor really hired Black as the new chancellor. Klein, for better or worse, was New York’s school-reform visionary. Bloomberg may say the system now needs a great manager, and he believes Black will turn out to be one. But what he doesn’t want, this time around, is big ideas. The mayor wants someone to sell his ideas. The line that got her in trouble came in mid-January. Meeting with a group of Tribeca parents upset about school overcrowding, Black quipped, “Could we just have some birth control for a while? It could help us all out a lot.” She’d been apologizing ever since. Six nights later, Black attended her first public meeting of the Panel for Educational Policy, a monthly ritual that is supposed to give the appearance of community input into the school system but instead functions as a forum for desperate parents to vent their anger and beg for help. Black sat stonily onstage until 11 p.m. as she was booed and taunted with condoms. At home in her Park Avenue penthouse, the long day ended with a grilled cheese sandwich and a glass of wine. “You know, it’s New York,” Black told me with a shrug the next morning. “And people are very opinionated, and so it’s quite an experience. You sit there and you just listen, you don’t respond. They have a point of view, or they’ve got placards, or they wrote songs. You know, it’s part of the American process. I did not bring my BlackBerry. I understand that had been a problem for too many people, including you know who,” she says, a mild jab at her predecessor, Klein, who was criticized for tuning out the demonstrators by reading e-mail. “But one could understand why you’d want to be on your BlackBerry, just doing whatever, crossword puzzles.” Last week, near the end of a raucous marathon hearing on school closings that went until 1:30 A.M., Black was less sanguine. When the crowd greeted her shouting for quiet with a mocking “Awwww,” Black topped it with an “Awwww” drenched in sarcasm. Then the mayor’s appointees to the panel voted unanimously to shut ten schools. Two days later, another twelve were axed. That night’s crowd chanted, “Black is wack” and “Black must go.” The week’s casualties included eight schools Bloomberg had opened. Black is but one part of the sophisticated campaign to rewrite the teacher-layoff rules. The Post’s news pages have been trumpeting a group of younger teachers who are supposedly rebelling against the inflexibility of the UFT’s leadership; the group is fueled in part by $160,000 that a private group co-chaired by Klein passed along from the Gates Foundation, one of the most powerful backers of Bloomberg’s education reform. Closing the circle, Klein now works for Post owner Rupert Murdoch. The ultimate target of all this lobbying is Governor Andrew Cuomo, whose backing is key to any significant overhaul of teacher-layoff policies. “A lot hinges on where Andrew comes down,” one Bloomberg adviser says. The mayor’s campaign contributions to State Senate Republicans could pay off as well. “If we have [Republican majority leader Dean] Skelos onboard and pass a good bill out of the State Senate, and raise enough public attention on the issue, through editorials and ads and everything else, and the governor is pounding away, it gets harder for Shelly [Silver, the Assembly majority leader] to ignore it,” another Bloomberg strategist says. He also highlights a further bit of leverage. “Quite frankly, this is Rupert’s top issue,” he says. “Does Andrew really want to lose the Post over this? And also make enemies of Mort Zuckerman and Bloomberg in his first few months?” If Cuomo pushes for the union and the city to negotiate a relaxation of the seniority rules, it would be an enormous victory for Bloomberg, with a minor assist from Black. But her real campaign is only beginning. Bloomberg has already made one Albany deal related to Black—though that one was forced on the mayor. Perversely enough, it could also turn out to be the best thing for the school system. 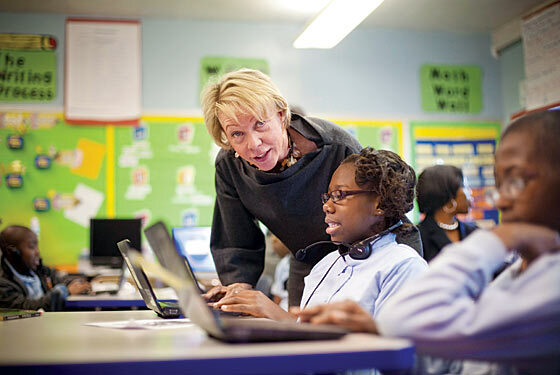 In exchange for granting Black the necessary non-educator waiver to become chancellor, New York State’s education commissioner compelled Bloomberg to install as Black’s second-in-command someone with actual education experience. The mayor picked Shael Polakow-Suransky. The 39-year-old South African immigrant is a fascinating character and a seeming contradiction. The son of anti-apartheid intellectuals, Polakow-Suransky attended an experimental school-without-walls public high school in Ann Arbor, Michigan, and then Brown University before moving to New York and becoming the founding principal of a small high school in the Bronx. Yet Polakow-Suransky has also become a true believer in standardized testing and data and was chief accountability officer under Joel Klein. There are tougher audiences ahead, and Black’s brutal start has only made the task of winning them over harder. If she can rebrand herself, and use her vaunted inspirational talent to ease the pain of reform, it wouldn’t just be a significant boost to Bloomberg’s educational legacy. It would be the greatest sale of Cathie Black’s life.